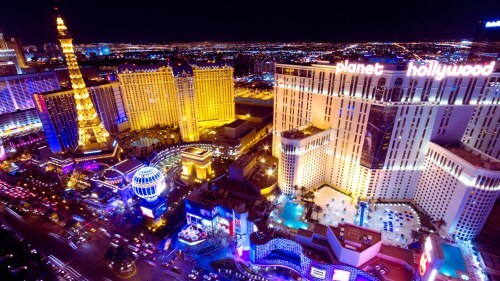 WestJet has dropped the price of their non-stop flights from Hamilton to Las Vegas down to $314 CAD roundtrip including taxes. There are some interesting dates available, such as over New Year's Eve (Dec 29 to Jan 5), and every weekend (Friday to Monday flights) throughout January, February, March, and April, including over Easter (Mar 30 to Apr 2). Perhaps this is a preemptive move against Canada Jetlines, who plans to fly out of Hamilton to 14 destinations in Canada and the United States (including Las Vegas) when they launch in 2018. 3. Use a departure date that is a Monday or Friday. Use a return date that is a Monday or Friday. Try dates between December 29th, 2017 and April 23, 2018. 4. On Priceline, the price will show up as $247 USD roundtrip including taxes. Priceline is *always* in $USD. This will work out to $314 CAD roundtrip when booked using a Canadian credit card, and including the typical credit card foreign exchange fee. Update 10/17 - Today, WestJet officially announced the new route from Hamilton to Las Vegas, and there are now multiple seats available for this price on each date, instead of just single seats. - The Dec 29th to Jan 5 flight (over New Year's Eve) is no longer cheap. - Neither is the Mar 30 to Apr 2 flight (over Easter). - Most other Friday to Monday flights between Jan 5 and Apr 23, 2018 are still available for $314 CAD, now with multiple seats.